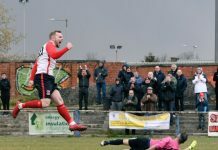 Clydebank secured West Premiership safety with a stuttering 3-1 win at home to Renfrew on Saturday. Goals from Jamie Darroch and Jordan Shelveyin the opening 90 seconds saw th burst out of the traps, with Nicky Little lobbing the goalkeeper from 25 yards to help end a run of five games without a win. Bankies boss Kieran McAnespie made one change from the side that lost to Auchinleck Talbot last midweek, with only Liam Rowan replacing Chris Black in midfield. And the first goal of the game came within the opening 50 seconds of proceedings at a dry Lochburn Park. Academy graduate Matt McLean’s long throw in from the left was headed on by Jordan Shelvey. Renfrew goalkeeper Danny McLeay got down well but could only parry the ball out to Jamie Darroch, who was on hand to stab the ball home. And things went from bad to worse for Renfrew, who conceded the second just 14 seconds from the kick off. 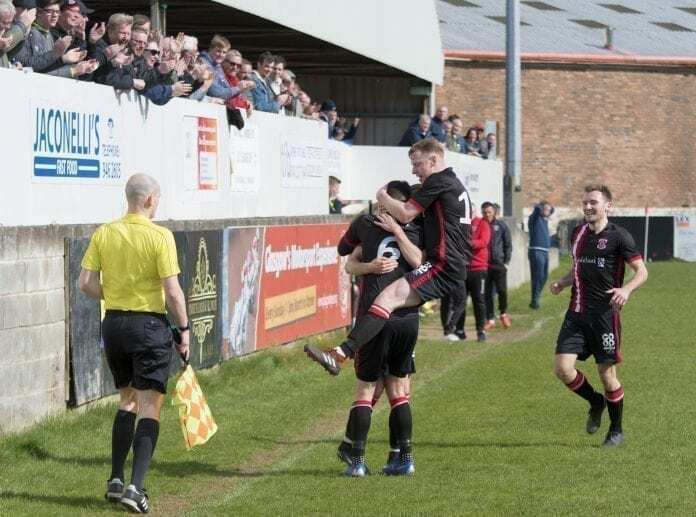 On his return to the starting line up, Rowan fed the ball to Shelvey on the edge of the area, who turned his man before sending a low shot across the goalkeeper to double Bankies’ lead. The goal saw Shelvey register his 16th strike of the season as Clydebank hit 87 for the season. Clydebank looked like they were flying in the opening stages, and looked as if they had strong claims for a penalty kick waived away soon after. Jordan Shelvey sent Cammy McClair through on goal, with McLeay lunging at the feet of the Bankies winger and bringing him to the ground. Incredibly, referee Stephen Brown gave the foul the other way, booking McClair for simulation in the process. Goal of the season? Not for us to say, but yes. While many expected the floodgates to open, in truth a largely uneventful 85 minutes ensued, with Renfrew missing the only other real chance of the first half. From a corner on the right, Allan was afforded a free run and rose highest and thumped a header over the bar in what was a lucky escape for McAnespie’s men. The relegation threatened visitors were looking dangerous from set plays, and found their way back into the game 12 minutes into the second half. A series of corners weren’t dealt with by the Bankies back line, with Kerr Allan on hand at the back post to steer a downward header past Waters to halve the deficit. After a largely uneventful second period, Bankies managed to put the game to bed with a third and ultimately decisive goal four minutes from time. Partick Thistle Lee Duncanson’s ball up the right hand channel bounced perfectly for Nicky Little, who spotted McLeay off his line, with Little lobbed the goalkeeper from 25 yards in what was a contender for goal of the season. 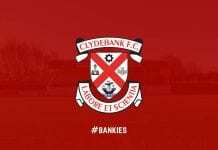 The victory sees Bankies sit in seventh spot with six games to play and next up for Bankies is the visit of Pollok this Saturday, and kick off at Lochburn Park is 2pm.